Ever since our last Chowdown, Tweetup or whatever you call it at Kalvin's, there seemed to be interest in another get-together. Karl was nice enough (or brave enough???) to organize the next one. 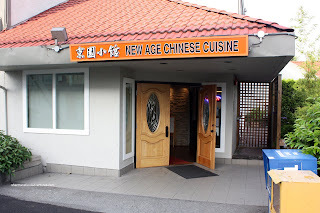 This time it was at New Age Chinese Cuisine. Mainly a Taiwanese joint with a little bit of Szechuan, this place is located within the Best Western on Kingsway in Burnaby. It really didn't look appealing outside; but on the inside, it had this modern bubbletea-like decor (think Pearl Castle). Originally, we were expecting over 10 hungry eaters; yet it withered down to 7 (including Karl, Ben & Suanne, Angie, Grayelf and Rey). No matter, more food fo r us! Prior to the dinner, Karl had reserved some items and sent out a menu. We had to take off a few things since we were hungry; but not that hungry. Besides, Mijune wasn't there to clean up. 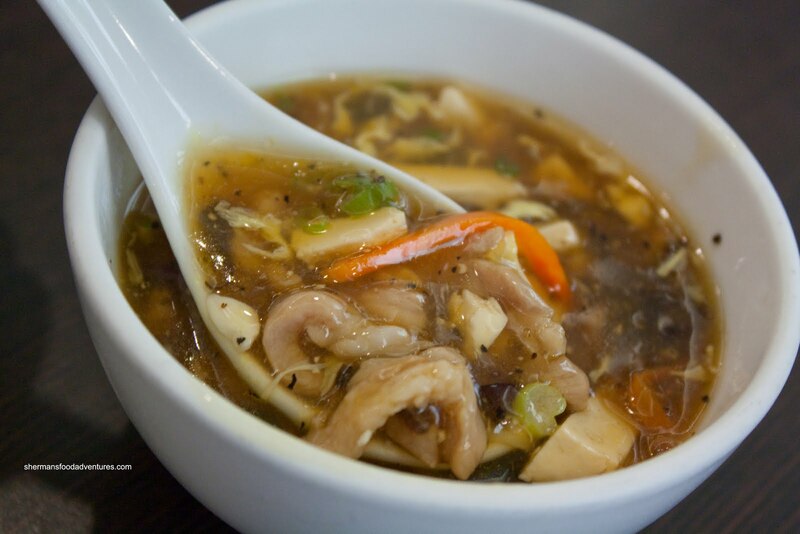 We did keep the Taiwanese Hot & Sour Soup though. Now, there is a difference between the Taiwanese and Cantonese version. The Taiwanese version is light in colour and much heartier. So, there was plenty of pork, tofu, carrots and wood-ear mushrooms which made the soup quite filling. I found the flavours in this soup muted. It was more savoury than hot and sour. 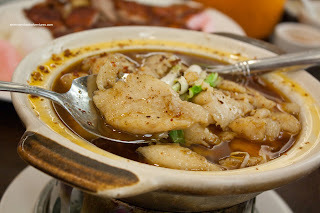 Next up was the Chicken in Xiao Sing Wine Sauce. This was prepared in a roulade sort of manner without the bones. Therefore, it was much easier to eat and uniform in texture. I found the meat to be sufficiently moist while there was plenty of wine flavour penetrating the meat. In addition, the wine was not too strong either where it was balanced off by a good amount of sweetness and saltiness. 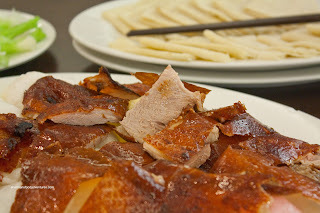 Now, one of the dishes that we pre-ordered, was the Peki ng Duck (2 courses). For the first course, we had the usual crispy duck skin and steamed crepes. The skin itself wasn't bad. It was indeed crispy and was pleasing to the eye with a rich colour. Moreover, the layer of fat underneath wasn't too overwhelming and in fact, some pieces had the fat scraped off. The few pieces that had the breast meat attached were moist. Now, all of this was completely wasted because the crepes were plain awful. They were steamed far too long and as a result were stuck together and to itself. I couldn't for the life of me unfold one without it completely breaking apart. Epic fail. Thus, this became more of a Peking roll than wrap since that's all we could do with the crepes. From duck, we stayed with fowl in the form of the 3 Cup Chicken. 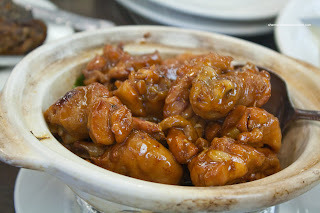 At first, I was impressed with the generous amount of meaty pieces of chicken. I've had this at many places that had more bone than meat. And one bite into the dark meat revealed generally moist, properly cooked chicken. However, there was a lack of flavour. I didn't get any tang from the wine nor did I get a whole lot of sweetness. It was actually kinda bland. 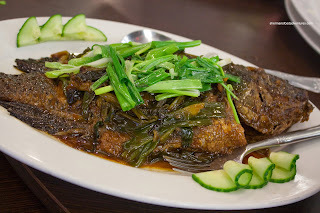 Moving away from poultry, we had the Fish in Spicy Sa uce served atop a chafing dish. Curiously, this wasn't all that spicy. In fact, there was a pronounced 5-spice slant to its flavour profile. If this was 5-spice fish, this would've been perfect. However, this was supposed to be spicy and it was not. On the other hand the Basa fillets were cooked perfectly and held together from spoon to plate. Then we moved onto another pre-ordered dish in the Fried Tilapia. Okay, lemme preface this first. I'm not a huge fan of tilapia. The soft, mushy texture of the flesh does not exactly fancy my tastes. Now, even with that disclaimer, the tilapia here was not very good. I found it even mushier than usual and the flavours were not very clean. I think Karl said it best, "the fish tasted muddy". Hence, the entire dish was not that pleasing to eat. Arriving and looking like it meant business was the Chicken with Chili Peppers. However, it was more an illusion than anything else. It did have a kick; but not in any way reflective of how hot it appeared. With that being said, there was nothing particularly wrong otherwise. The chicken was boneless (which is not a given these days - see New Szechuan), moist and flavourful despite the lack of heat. If one didn't have the expectation of it being very spicy, there would be not much to complain about here. Now for one of our pre-ordered dishes - the Braised Pork Shank. This was executed quite well as the skin was gelatinous and appealing in colour and texture. Most of the meat was fork-tender and moist. 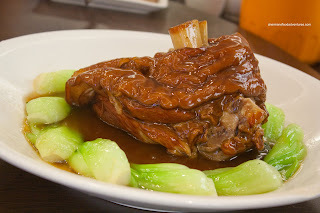 Furthermore, the shank itself was a fair size portion (although it was $26.00, so it better be large). A small section was a bit drier and stringy; but that is pretty normal as there is not as much fat in that area. 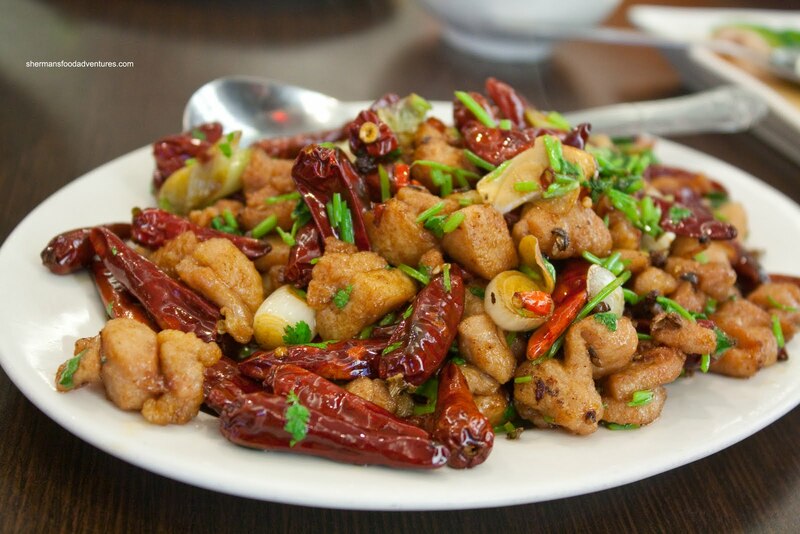 Unlike the one I had a New Szechuan, the majority of the meat was edible. On the other hand, I did find the starch- thickened sauce to be on the bland side and not exhibiting any depth or richness. The colour was there; yet there wasn't particularly any taste. 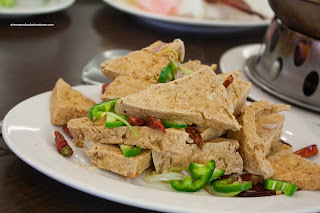 On the topic of no flavour, I found that the Fried Tofu with Spicy Salt to be muted as well. I mean, look at it, you can readily see peppers and chilis. That in itself would indicated a punch, a kick or an outright uppercut to the tastebuds. But no... Instead, we got a plate of perfectly fried tofu which was properly seasoned while mysteriously missing spiciness. It was like they were trying to play a trick on or confuse our sensory systems. So I'm sure you get the picture here. The meal as a whole was actually very good despite the lack of heat. If one wanted mild-tasting food, this would ace that request in spades. So despite our disappointment in the lack of spice, the food was good. Now, if you look at it from the angle that the food should have some pop and impact, then there was something definitely missing here. I guess how one judges the food will be specific to their personal tastes (which is generally the rule with any restaurant anyways). Like I said, I’ve never had a bad lunch at New Age. I’m still baffled how nearly everything was so far below par. @Ben & Suanne Yah, I'm pretty sure they can be better. I would return! @Karl Yup, I'm baffled too. Will try again!